Join one of the most revered rock guitarists of all times as he shows you the tricks and concepts behind his incredible lead playing. From Dokken to Lynch Mob to Souls of We, George Lynch will teach you how to play his most killer licks! Plus learn to expand your soloing skills with a variety of Lynchian lead techniques. A hand signed custom modified version of Mr. Scary's new Zoom G2G digital pedal. Each pedal we sell on the Mob Shop has 3 additional custom patches created and programmed by Lynch and saved as a user presets.. It takes an exceptional cable to keep up with heavy metal guitar icon George Lynch. That's where Spectraflex comes in!!! Introducing the "Mr Scary Cable".....the First Edition in our George Lynch Signature Series. A combination of legendary Spectraflex components and original elements devised by Lynch, the result is extraordinary. Just a quick glance at the connector housing's cryptic artwork, courtesy of notorious jewelry designer Room 101, tells you this is no ordinary cable. This solid black, braided beauty is designed for extended frequency response and extremely low handling noise. The "Mr Scary Cable" sounds as stunning as it looks. Join one of the most revered rock guitarists of all times as he shows you the tricks and concepts behind his incredible rhythm playing. From Dokken to Lynch Mob to Souls of We, George Lynch will teach you how to play his most killer riffs! Plus learn how to expand your soloing skills with a variety of Lynchian rhythmic techniques. 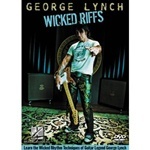 This tab book features tab from the Lynch Mob Wicked Sensation CD, including, All I Want, Dance Of The Dogs, For A Million Years, Hell Child, No Bed Of Roses, Rain, River Of Love, She's Evil But She's Mine, Street Fightin' Man, Sweet Sister Mercy, Through These Eyes, and Wicked Sensation. It takes an exceptional cable to keep up with heavy metal guitar icon George Lynch. That's where Spectraflex comes in!!! GEORGE LYNCH Signature Series Guitar Cable. This CD includes all the tracks from "SYSYGY", "STONE HOUSE" and "THE LYNCH THAT STOLE RIFFNESS".